Advances by the Rice University lab of James Tour have brought graphite's potential as a mass data storage medium a step closer to reality and created the potential for reprogrammable gate arrays that could bring about a revolution in integrated circuit logic design. 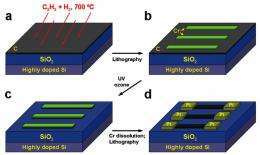 In a paper published in the online journal ACS Nano, Tour and postdoctoral associate Alexander Sinitskii show how they've used industry-standard lithographic techniques to deposit 10-nanometer stripes of amorphous graphite, the carbon-based, semiconducting material commonly found in pencils, onto silicon. This facilitates the creation of potentially very dense, very stable nonvolatile memory for all kinds of digital devices. Graphite's other advantages were detailed in Tour's earlier work: the ability to operate with as little as three volts, an astoundingly high on/off ratio (the amount of juice a circuit holds when it's on, as opposed to off) and the need for only two terminals instead of three, which eliminates a lot of circuitry. It's also impervious to a wide temperature range and radiation; this makes it suitable for deployment in space and for military uses where exposure to temperature extremes and radiation is a concern. "As a result of that, people are only hesitantly investing in new chip designs," said Tour. "They stick with the old chip designs and make modifications. FPGAs are chips that have no specific ability, but you use software to program them by interconnecting the circuitry in different ways." That way, he said, fabricators don't need expensive mask sets to try new designs. Cool, its an electronic zipper.